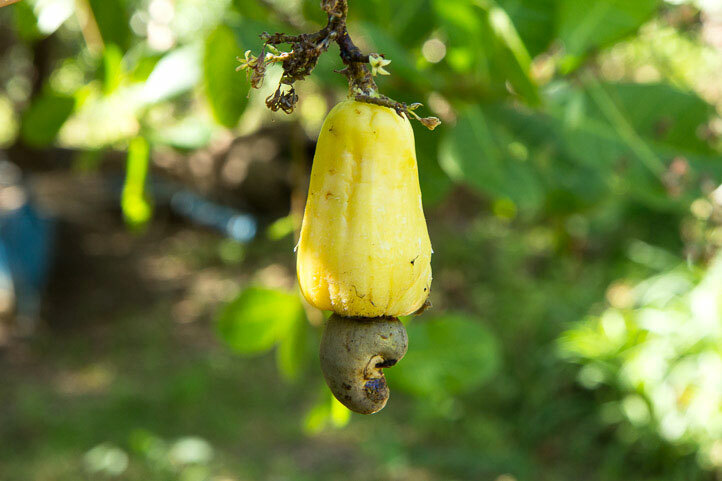 I took my first cashew pictures 3 weeks ago. At that time, the apples were still tiny and green. Now they’re ripe, so I’ll introduce them to you. In only 3 weeks, an impressive change has occured in the cashew trees of Banuang Daan. 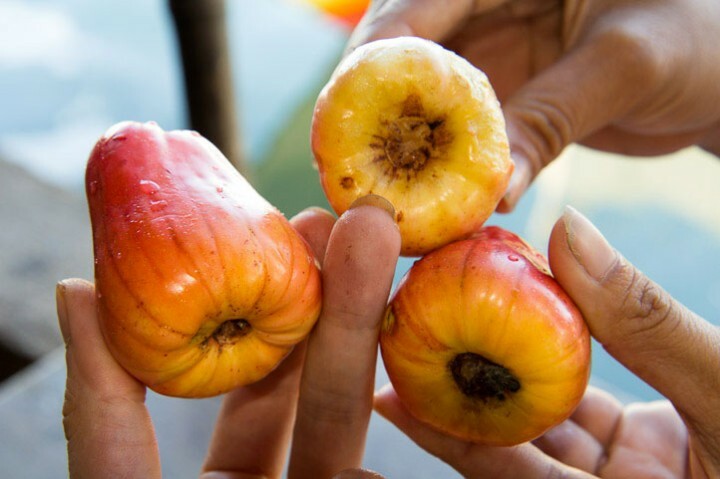 The small cashew apples – that would deserve the name of pears, because of their shape – have grown a lot and took nice colours. Some of them are yellow, some are reddish. I delicately pulled a branch of the cashew tree to take this photograph of the apple. There were actually two on the end of the branch. Even though I really tried to be gentle, one of the apples, perfectly ripe, fell on the ground. It only dropped from a height of one meter, but it totally smashed, even though the ground was covered with grass and leaves. A real purée that proved right the legendary fragility of the cashew apple. Yesterday I met Irene, a young woman from Mindoro who spent her childhood around cashew trees. She was eating big slices of a funny fruit when I saw her. I came closer to have a proper look and asked what it was. It was cashew apples with salt. The salt helps draining the water from this fruit (or pseudofruit if you want to be precise) as it’s full of it, really. It seems like it’s only made of water, even worse than cucumber. I tried to eat some of it. It tastes like mango, cucumber (speaking of the devil), citrus fruit, it’s good, but the texture is really unpleasant. I expected something as crunchy as cucumber. Or water apple, because it really looks like a cashew apple. But it’s in fact very fibrous, it’s like eating cotton-candy that would be more cotton than candy, changing into fibers and water in your mouth as you eat it. I’m thinking that, after all, it’s a fruit, so I try it without any salt, and it’s not as good. Irene told me that the best way to eat it is to chop it really finely and to put some salt on it. Indeed, when it’s thinly sliced, you cannot feel the disappointing texture any more and you can focus on the aromas. Besides, it helps the salt drain the fruit thoroughly, so it will be firmer and easier to digest. But most of all Irene gave me some ideas, some great ideas. You’ll see that in a fourth article: we’ll make acid bombs with cashew nuts and charcoal. The video’s coming soon. 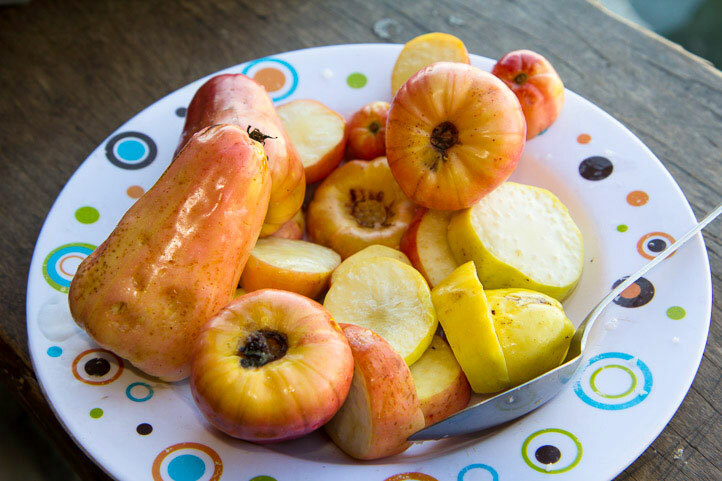 You are incorrectly calling the fleshy portion, know as the “apple”, a fruit when it is actually a pseudofruit. Yes, I explain all that in the other articles of the cashew series. I just did not precise it in this one, but you’re right, I should mention it here too. Brings back memories. I remember picking these from trees when I was a kid. It was sweet but very astringent as you have experienced. The only way to cover up this astringency is to have more bites! How long do you leave the salt on cashew fruit slices before eating? You can eat them more or less right away; the salt is simply a way to enhance their delicate flavour. Some watery fruits are excellent with salt, like watermelon, cantaloupe, etc.